Some of the recipies are supposed to contain as many as 72 different ingredients, including Mint, Birch leaves, Maize, Vervain, Sapwood, Licorice, Chamomile, Blackcurrant leaves, Poppy seeds, Thyme, Coriander, Parsley, Cinnamon, Star anise, Fennel, Summer savory, Cumin, Licorice and Aniseed. The notorious liqour Absinth also called "The Green Fairy" due to it's greenish hue was the favourite tipple of writers and painters like Monet, Oscar Wilde and Vincent Van Gogh. Sadly it was responsible for severe problems as it contained the herb wormwood which is in fact toxic to the nervous system. As a result Absinth and all other liqours containing anise such as Pastis were banned by about 1920. Fortunately the ban was lifted in 1932 after it was realized that the problem with Absinth was in fact the wormwood and Pastis made a come back through men like Paul Richard, a disgruntled seller of "vin ordinare", who decided that there was an great opportunity to commercialize the production of Pastis and from humble beginnings in his parents back yard created a huge world wide business; all from the humble Pastis. Pastis is the perfect aperitif; every time you sit down for a meal in France there is the inevitable question, "un aperitif?". 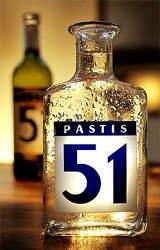 So next time order a Pastis which will come in a short glass with a jug of chilled water. The Pastis is a slighly viscous, pale straw coloured liquid which as you add water turns a milky white due to the oil of mint crystalizing out.